Sarah saw her own flat Persian face reflected in the prism as it toppled out of its jerry-rigged base. Sarah was one of three dozen kittens who all lived in a cozy garage that had been retro-fitted into the perfect Persian cat playground. Scratching posts and cat toys littered the floor. The walls were a veritable maze of carpeted shelving — perfect for perching. Sarah ran wild with her sisters, brothers, litters worth of cousins, four aunts, mother, and grandmother. They were all fluffy, white, purebred fuzzballs just like her. She felt safe and loved. “They’re all playful at this age,” Master said. Sarah and several of her cousins chased the string, tumbling over each other and themselves, trying to trap it against the floor with their claws. The new human dropped the string. Sarah’s cousins lost interest and scurried off. Sarah continued clawing and chewing at it until the new human picked her up. She held Sarah with two hands, flat Persian muzzle only inches from her own face. Sarah looked the human right in the eye and meowed to be put down. She had a string to catch! The humans moved to a table in the corner of the garage where they signed and traded pieces of paper. Sarah lost interest in them and their boring human ways. Her mother, however, had had litters before. She knew what was coming, and she came to Sarah, washed her face, and purred at her to tell her it would be okay. It was the start of an adventure, the start of a new life. The new human put Sarah in a cat carrier with a squeaky yellow mouse toy and a bunched up towel. It smelled warm and fresh. It was comfortable and different. Sarah felt like she was hiding, and hiding was fun. The human stopped talking, and Sarah got tired of hiding. She scrabbled at the door of the carrier, but it didn’t open. She meowed that she wanted to go home. She meowed it again and again. Finally the car stopped. The human got out and brought the carrier with her. The human set down the closed carrier and left it on the floor. Sarah stopped meowing, but she kept scrabbling at the door of the carrier. It must not have been fully latched, because she managed to pry it open. Sarah peeked out, but she wasn’t greeted by the friendly nose of one of her cousins. She stepped out of the carrier and into the scientist’s lab. She looked all around, but she didn’t see any cats anywhere. No sisters. No brothers. No cousins, aunts, or grandmother. Not even a mama. No other cats at all. That wasn’t quite true. Sarah realized that she did see a cat — or the shape of a cat, sleeping on a pile of books on a lab table. It was a high table, but Sarah jumped up to see the cat better. He was an orange tabby, but half of the time Sarah could see right through him. It was as if he wasn’t there, and he was there, at the same time. “Who are you?” Sarah meowed. The orange tabby lifted his head and looked at her with golden eyes. At the same time, he lay still, continuing to sleep. It was as if Sarah was seeing two cats occupying the same space. They overlapped and faded into each other, looking clear and strong together, but faded and transparent when they moved apart. “I’m Fred, the lab cat,” the orange tabby said. He also didn’t say it, instead rolling over and yawning. Sarah blinked, confused. Yet, no matter how strange Fred seemed, he was more like her mama cat than anything else in this strange place. “Why are you… both?” Sarah asked. Sarah had been hissed at before. She had lots of cousins. It didn’t faze her. “There aren’t enough cats here,” she said. “Only you — or the two of you — and me. Will you be my mama?” She purred hopefully and stepped toward the double tabby. Sarah didn’t quite know if Fred was there or not — would his claws scratch her or pass right through? She played it safe and ran, dashing haphazardly along the lab table. When she reached the end, she jumped to the next. Sarah flattened her ears at the sound of the scientist’s raised voice. Master had never yelled. She didn’t like this new human or her strange cat. Sarah ran away from both of them. She ran straight into the half-meter tall, rhomboid, crystal prism that the scientist was yelling about. 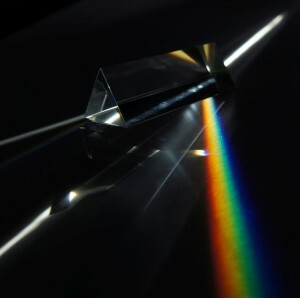 Sarah saw her own flat Persian face reflected in the prism as it toppled out of its jerry-rigged base. Laser light scattered in every direction, and Sarah felt herself pulling apart, stretching out. The smell of ionization and singed cat fur filled the air. Fred laughed. He also looked away in disgust. He hadn’t wanted to share his role as lab cat with a single white puffball. He certainly didn’t want to share with red, orange, yellow, green, blue, indigo, and violet ones. A harmony of meows — higher pitched from Violet, Blue, and Indigo; subtly lower from Red — expressed surprise and confusion. All seven of Sarah looked at each other with wide green eyes, unchanged by the prism. On Green, her eyes and fur matched perfectly, a solid emerald kitten. On Red, her sparkling green eyes framed by ruddy red fur gave her face a Christmas look. Red flopped onto her side, feeling slow and languid. Orange flopped down beside her. They bathed each others’ ears, a strangely intimate sensation, more so than bathing the ears of a cousin. Violet, Blue, and Indigo practically vibrated with excitement and began chasing each other, mewing in delight at playing kittens’ games again. Except this time, there was no fighting, no compromise like with her litter mates. Violet, Blue, and Indigo were all Sarah, and they all wanted to play the same game. Yellow, followed by Green, cautiously approached Fred. He was still the closest thing to a mama cat around. “What happened to me?” she meowed. Green’s voice echoed hers, a perfect copy cat. “Science,” Fred meowed, one of him with a sneer and the other with reverence. “Don’t get used to this,” the scientist said, scooping Red and Orange up. They were too lazy to run. “My sister would kill me if I gave her son seven kittens.” It took longer to catch Violet, Blue, and Indigo as they skittered around the legs of the lab table. Yellow and Green tried to cower behind Fred, but he had no interest in shielding them. Soon the seven kittens of the rainbow found themselves dumped together into a cardboard box, their brightly colored fur mashed against each other. “That should hold you while I reverse the setup,” the scientist said. All seven of Sarah heard the scientist messing with her lab equipment. Several of her squirmed; the others lazed together, calm and accepting. Yet, they all felt warm and cozy so close together. The scientist picked up the box of Sarah. Claws dug into the tilting cardboard, but it was too smooth to get a good purchase. The seven kittens slid out and landed in a pile next to the rhomboid prism again. Violet, Indigo, and Blue tensed their muscles to pounce away, but they weren’t fast enough. The laser light hit them, shining from every direction. All seven kittens squeezed closer together, fusing into one space. Fusing into one kitten. The buzz of electronics powering down. The zip of lasers turning off. Sarah’s mouth felt dry and coppery. Her white fur fluffed with static electricity. She jumped, startled. Through the metal grated door of the carrier, now properly latched shut, Sarah saw Fred, still lying on a lab table. “Goodbye, Rainbow Cat,” one of him said. The other winked. Apparently, he felt more charitable toward a kitten who was leaving. This time, Sarah settled into the rumpled towels, folded her paws beneath her, and waited quietly through the car ride. Her mind felt noisy, filled with the memory of all the different kittens she’d been. She felt lazy and energetic, curious and bored all at once. The car stopped. The scientist got out and brought the carrier with her. Sarah heard shrieking and giggling — higher pitched human voices than she’d ever heard before. “Hold on, Toby. Let me take her out.” The scientist opened the grated metal door and lifted Sarah out. A single pair of green cat eyes looked over the scene — children in paper hats, streamers hung tantalizingly from the ceiling, and toys everywhere. It was complete chaos. It was exciting. The memory of her violet, blue, and indigo selves tensed, ready to skitter and leap at the dangling streamers. The part of Sarah that had been red and orange wanted to laze on the floor, batting idly at one of the plush toys. The rest of her stared wide-eyed at the children. One of the children, a boy with a hat shaped like a plush birthday cake complete with cartoony candles on his head stepped forward. “Oh, Auntie, she’s beautiful.” His brown eyes were wide with wonder, just like Sarah’s green ones. The scientist handed the little bundle of white fluff to Toby. His hands were small and squeezed, but Sarah wriggled until he held her better. “Sarah’s a boring name,” Toby said. “She needs a hat!” one of the other children declared. Toby shifted Sarah, now Rainbow, into the crook of his arm, grabbed a paper hat, and placed it over her ears. Rainbow’s flat white muzzle frowned, but she opened her mouth and gnawed on the paper hat’s string. Toby laughed. His delight more than made up for the indignity of the hat. Rainbow purred. All of her. For the rest of the afternoon, Rainbow was handed from one child to another, dressed in doll clothes despite protestation, and tempted with strings. She didn’t miss her cousins and littermates at all. The children kept her plenty busy, and she could still feel all the different colors inside of herself. When the party was over, Toby took Rainbow up to his room. He put her on the bed, and the sunlight from his window warmed the white fur on her back. The scientist was gone, and Rainbow liked Toby. She decided to trust him with a secret. She relaxed and let herself drift apart, come unfocused. She’d realized that she could do it again: one white kitten split into seven colorful ones. Seven pairs of green eyes stared at Toby from a rainbow of kitten faces. Sarah focused herself and fused back together, all of her wanting to nap in the sunlight while Toby petted her. She was one cat, but one cat could be many. Love this story and The Empty Empire. A happy ending is so welcome. Your website is clear and clean, a comfortable place to hang out. Thank you for writing. I’ll be back. Next Next post: Cat Stories!